New listingHornby Dublo Right Hand Electrically Operated Point, Boxed. The purpose of these sales is to give up space for a newGauge 1 railway, work starting in 2019. The point has been tested and is fully working. hornby point motor surface mounted. Designed to be positioned either side of any Hornby point. Maybe be used with the Hornby R8216 Digital Point / Accessory decoder. If in doubt consult the Hornby Helpline. Hornby Trains Sets. SURFACE MOUNTED POINT MOTOR. Hornby R8073 OO Gauge Nickel Silver Right Hand Point. Condition is New. Dispatched with Royal Mail 2nd Class. Oo gauge Hornby made in England points 8×left hand and8×right hand. 12 × surface mounted point motors and a block of 11 point switches. All in good condition. Happy bidding. Excellent quality nickel silver Hornby R8075 Right hand curved points. All sleepers and fishplates are present and in very good condition. There is no tarnishing and all rail tops are cleaned prior to packaging. The points are fully springed and have a positive switching action. Thank you for taking the time to view products supplied by Simply Rails. New listingNEW HORNBY R8078 RIGHT HAND EXPRESS POINT. Unused. NEW HORNBY R8078 RIGHT HAND EXPRESS POINT. Unused.. Condition is New. Dispatched with Royal Mail 1st Class Large Letter. 5 out of 5 stars - NEW HORNBY R8078 RIGHT HAND EXPRESS POINT. Unused. 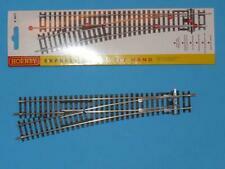 1 product rating1 product ratings - NEW HORNBY R8078 RIGHT HAND EXPRESS POINT. Unused. 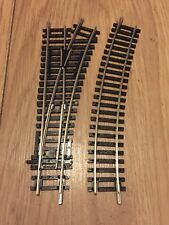 2 X HORNBY RIGHT HAND STANDARD POINTS (OO GAUGE) BOXED LOT E11 IN VERY GOOD CONDITION. This motor in good used condition. It would be a useful addition to any layout. 1 x Hornby R8076 Y Point Track - OO Gauge Brand new in packet Please note that the sale is for 1 item - the 3 in the photo are just for illustration purposes I do combine postage to save you money. Please feel free to ask. Please take time to view my other Track and Accessories - thanks. 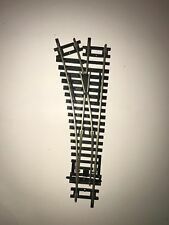 Hornby R632 Y Point Passing Loop Track Pack. Condition is Used. 1 x R632 Y Point 3 x R600 straights 2 x R628 curves Dispatched with Royal Mail 1st Class Large Letter. For sale, two Hornby point motor housings. good condition. HORNBY - R.612 Right Hand Point - 00 Gauge. Condition is Used. Dispatched with Royal Mail 2nd Class. 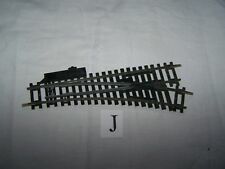 Hornby R8072 Left Hand Standard Point Track 00 Gauge. Condition is New. Dispatched with Royal Mail 1st Class. For sale, a Hornby 00 gauge N/S "Y" point. Good working order. For sale, a Hornby 00 gauge N/S curved left hand point. Good working order. 2 x HORNBY POINTS Nickel Silver, made in China. In very good condition.